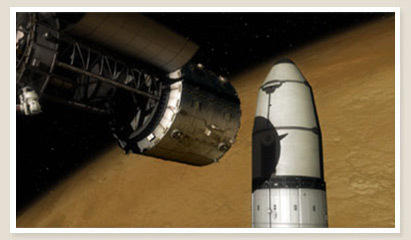 Race To Mars – the first human mission to Mars. If you like dramatic weather, dusty conditions and the most extreme natural landscapes in the solar system, the spectacular red planet of Mars could be your destination of choice. Driven by the fine, sunlight-absorbing dust that engulfs the planet instead of the water that triggers meteorological changes on Earth, the weather on Mars is characterized by dust storms, dust devils and raging winds. The two hemispheres of Mars, like those of Earth, experience four seasons, and carbon dioxide condenses and forms seasonal frost deposits during the Martian winter. The weather on Mars is mostly predictable, and while the average global temperature is cooler than Earth at 55°C (-133 to 27), temperatures can rise and fall quickly. With an atmosphere only 1% as thick as Earth’s and no magnetic field to shield from solar flares and cosmic rays, the Red Planet offers harsh conditions that are much more severe than on Earth. 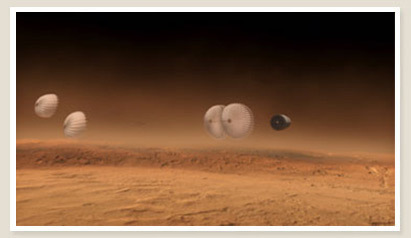 The dry Martian atmosphere contains a significant amount of suspended dust. More like flour than the sands of Earth, these small grains of dust can be as fine as cigarette smoke. 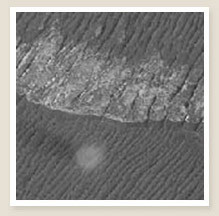 Unlike most common Earth sand and fuzzy dust, Martian dust particles are sharp and oddly shaped. As solar heat warms the atmosphere, it moves the air, sending the dust swirling. Regional dust storms generally persist for a few weeks before dissipating, but there are occasional planet-wide dust storms that turn the air orange and hide the surface from view. 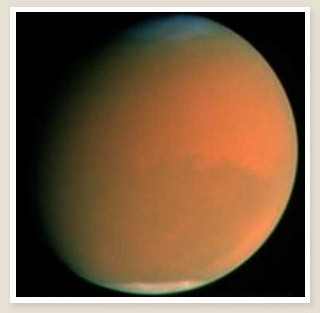 Dust storms are more common in late August, at the Red Planet’s closest approach to the sun. 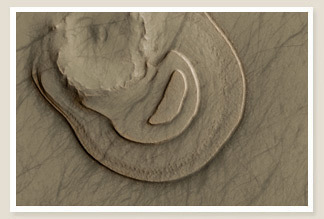 Spectacular dust devils, the visual markers of a wind vortex, pick up dust off the surface of Mars, creating criss-crossing tracks as abstract as a Jackson Pollock painting. Although the lower atmospheric pressure means they don’t have much force behind them, the fast moving Martian dust devils can be up to ten times taller than those found on Earth, up to ten kilometers high. They are often electrically charged, creating electromagnetic interference that can affect the function of electronic equipment. And they cause extreme static cling, making it tricky for astronauts to completely clean themselves off when re-entering their habitat at the end of the day. Mars habitats may end up with a thin film of dust coating everything inside despite best efforts to keep them clean. Dust is treacherous for Mars expeditions, causing static charges, jammed spacesuit joints, leaking air pressure from seals and spacesuits, dirty and weakened solar power panels, shorting equipment, clogged filters, obscured warning lights and scratched windows and lenses. If dust does get into the crew’s habitat, it can irritate lungs, skin and eyes. Dust storms block visibility and communication. The crew won’t be completely defenseless, however: dust can be removed or reduced from environments and machinery through electromechanical methods, including tilting, shocks or ultrasound that break the electrostatic (static-cling) effect of the dust, as well as air filters and dust-repellant coatings. The Red Planet moniker is a bit of a misnomer. Early images seemed to show Mars with a dark pink sky, but to scientists’ surprise, a colour correction conducted with images from the 1997 Pathfinder mission revealed the Red Planet’s true colour. The daytime sky offers a warm-hued ambiance with a brownish-yellow butterscotch colour. 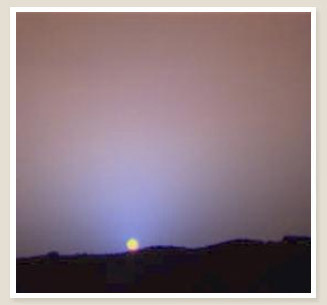 The Martian dust active in the planet’s atmosphere can lead to sunsets and sunrises opposite to those of Earth: instead of our blue-sky with pinkish/red effects around the sun, Mars presents pinkish-red sunsets/sunrises with touches of blue in the vicinity of the sun. The effects are caused by the vast amounts of Martian dust in the atmosphere. Illumination of the dust in the atmosphere also causes twilight to last last much longer. 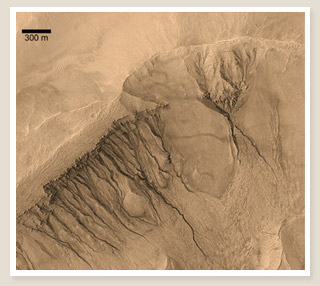 The terrain of Mars is characterized by exaggerated extremes, including massive canyons, such as Valles Marineris along the equator, and Olympus Mons, the tallest volcano in the solar system. At 25 kilometers high, Olympus Mons is three times higher than Mount Everest. Scenic impact craters, such as the enormous Helias Basin, along with channels, gulleys and low lying plains that were once rivers and ocean beds are worth exploring. Assess risk. The larger the hole, the greater the risk, and the lower the amount of time until the O2 runs out. Interim patch. A temporary seal of some special-purpose material may help. Find safe environment. Return immediately to the spacecraft. Although it’s stronger than that of the Moon, the surface gravity of Mars (3.71 meters square) is only 38 percent of Earth’s (9.81 meters square). In order to counteract the detrimental health effects of low gravity on bone and muscle tone, visitors will still have to exercise while on the surface of Mars. 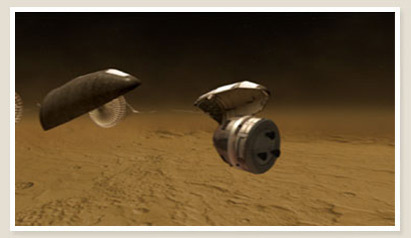 Visitors to Mars can also experiment with low gravity movement. Astronauts exploring the Moon’s surface discovered that in a bulky space suit, bunny hopping, or lightly jumping across the surface was actually more efficient than walking. Martian explorers might develop some unique forms of locomotion of their own. Thirty-nine minutes may not seem like much of a difference, but when your body clock is set to the Earth day, adjusting to the longer Mars day isn’t easy. During NASA’s Mars Exploration Rover Mission (2003), scientists and engineers working as mission control crews lived on Mars time on Earth, keeping in direct contact with the rovers in shifts, 24 hours and 39 minutes a day, seven days a week. Although some of the crew adapted to the rotating schedule, many found it difficult. Wearing special watches that kept Martian time, the crew coped with the stress and fatigue that comes with the disruption of one’s circadian rhythm plus the difficulty of juggling a family and social life while living in a different time zone. 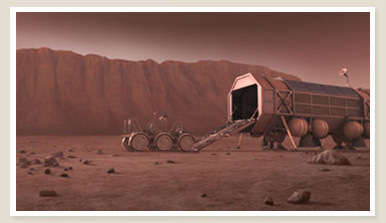 During their stay on Mars, visitors will live in a surface habitat. 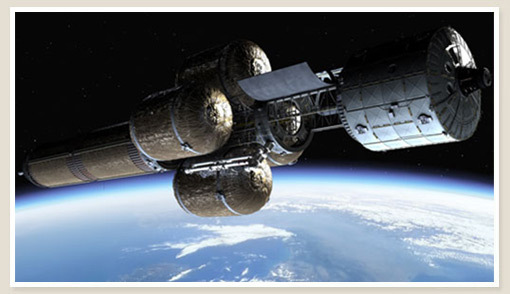 Some missions call for the habitat to be pre-launched into space in multiple parts and pre-assembled in low-Earth orbit. It will be sent to the planet ahead of the crew, and will be ready and waiting on the surface by the time the astronauts get to Mars. Designs very, with the one shown here shaped like a cylinder with two conic end domes, and standing a meter off the ground for convenient underside access. The external structure includes an octagonal frame for easy landing gear and equipment attachment. An advanced Extra-vehicular activity (EVA) facility features equipment storage, and the habitat’s airlock leads to an external porch and ladder. A negative pressure space is electrostatically charged to remove dust. A rear emergency exit includes its own pressure port. Herbs, including onion and garlic. Although you can’t step outside for a breathe of fresh air, life in space resembles Earth rhythms, in that it follows daily patterns and routines revolving around eating, sleeping, working and relaxing. A mission to Mars can take one and half to three years, depending on how much time is spent on the surface. The Race to Mars mission calls for the crew to be in space for 522 days, only 60 of which will be spent on the surface of Mars itself. 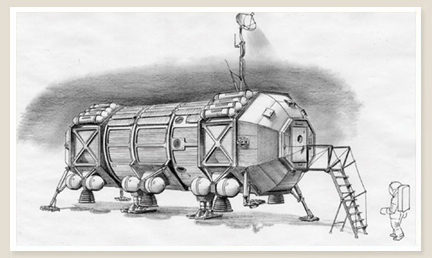 During the transit to and from Mars, the crew will live in a special habitat with room for up to six astronauts. It will include private crew quarters, a medical bay, a flight deck, and airlock and storage for oxygen, water, food and other supplies. Over the course of their 582-day trip, the Mars crew will be traveling in space 522 days, with only 60 days spent on Mars itself. 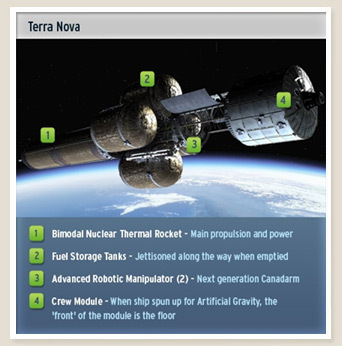 During transit the crew will live on board the Trans-Hab unit of the Terra Nova vehicle. 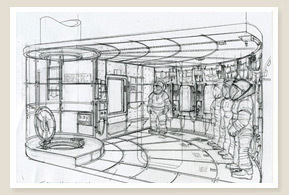 With room for six crew members, the Trans-Hab has private crew quarters, an airlock, medical bay, science stations, control systems and storage for oxygen, water, food and other supplies. Unlike previous NASA missions, the crew traveling to Mars will have nearly autonomous control over its own day-to-day scheduling. The crew will work from a master schedule developed in advance, but light-time communications delays varying between a few seconds and 44 minutes will make it impossible for ground crews to micromanage the Mars astronauts’ schedule, a practice that has raised tensions between the crew and the ground in the past. Instead of mission control, the ground crew’s role will be one of mission support. 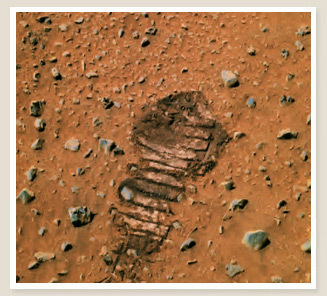 A message can take anywhere from 3 to 22 minutes to travel between Mars and Earth (and the same length of time for a response to get back), making normal conversations with ground crew or family members impossible. Mars astronauts will chat in real time only with each other, communicating with the ground with messages, files and reports via special software over a delay-tolerant network. 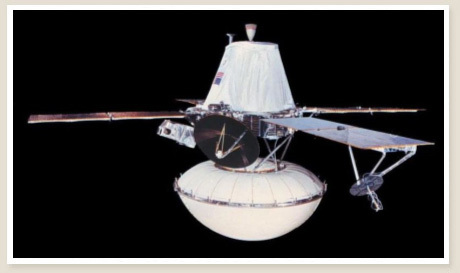 The Mars crew will be required to do its own troubleshooting, respond first in case of emergency and will be self sufficient if an extended loss of communication occurs. Water is carefully conserved in space, so astronauts only shower only rarely. Although they can wash their hair with a special no-rinse shampoo applied with a towel, give each other haircuts and shave with an electrical or disposable razor, astronauts must be very careful to vacuum loose hairs and whiskers, which can get into equipment and clog filters. Astronauts use their favorite toothbrushes and toothpaste for brushing their teeth, but instead of using water and a sink, they spit the toothpaste into a towel. 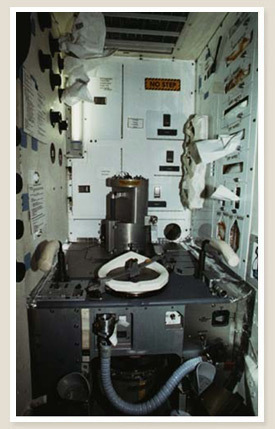 Bathroom from the Space Shuttle. The crew’s tiny washroom contains a unisex urinal, odor and bacteria filters and a space toilet. Built for microgravity conditions, space toilets are more like toilets on a plane than the kind you use at home. 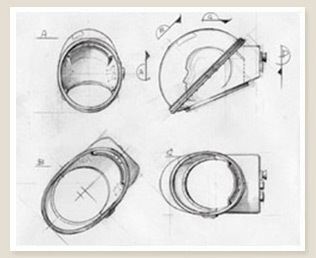 Consisting of a small raised bowl and seat, the space toilet vacuums solid waste into a compartment. Each astronaut has a personal urination device that looks like a small cup. The cup is connected to a long plastic tube that sticks out of the wall and vacuums urine away into the waste compartment. In order to use the space toilet or urinal in microgravity, astronauts need to strap themselves in so they don’t float, which means using either device can take as long as 10 minutes more than it would on Earth. While wearing their spacesuits, the astronauts will use the Maximum Absorption Garment, a large adult diaper. Breakfast: scrambled eggs, a tortilla, dried fruit and trail mix. Lunch: smoked turkey tortilla wrap, almonds, dried peaches and lemonade. Dinner: teriyaki chicken, corn, rice pilaf, mixed vegetables and a tortilla, with a brownie for dessert. Station inspection, hygiene, breakfast, daily planning, status reports, email. Work (8 hours): systems operations, trash collection, assembly, maintenance, traffic operations, medical operations, routine operations, science. Days off: communicate with friends and family, read, housekeeping, listen to music, play games. NASA food scientists spend their careers planning and perfecting the food astronauts eat, and their biggest challenge yet is creating tasty dishes with a five-year shelf life for the Mars expedition. The good news is that with hydroponics, the Mars-bound crew may be able to grow lettuce, tomatoes, onions, wheat and other food in space. 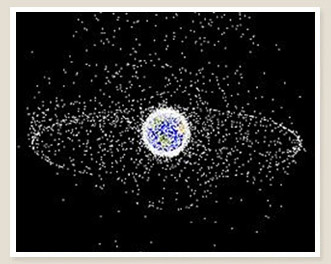 Food selected for space is chosen for minimal crumbs (crumbs float!) and ability to withstand mold and bacteria, which is why tortillas are popular. In microgravity conditions, astronauts’ sense of smell is dulled in space when the fluids in their bodies, such as blood, shift upwards as a result of lowered gravity and cause nasal congestion, so food scientists have been working to add more tang and zest to space food. Texture is also important: astronauts appreciate the occasional crunch, which is more difficult to achieve when most of your food comes dehydrated in plastic pouches. Astronauts add water to the pouches and heat them as required. Additional seasonings, including salt and pepper are available in liquid form and attached to the communal table where the astronauts eat together. Because much of the Mars flight will be automated, the Mars crew will have a great deal of free time available, which means there’s a risk the crew might get bored. 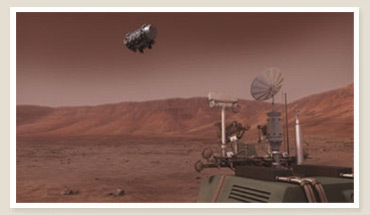 Mars crew members will be encouraged to cultivate sedentary hobbies, such as computer programming or gaming. They may even choose to spend their time studying and doing correspondence courses. During downtime, the crew can communicate with family and friends, listen to music, read, play games or watch movies. Most astronauts bring an electronic collection of family photos, messages and video clips with them. And while the exhilarating view of Earth or Mars from space never grows tired, the many months in between won’t offer much in the way of a stimulating view. Each astronaut will have their own sleeping compartment equipped with a sleeping bag, pillow, light, air vent and space for personal belongings. Sleeping bags are rigid on one side so they feel like a mattress. Although sleeping in artificial gravity is similar to sleeping on Earth, when astronauts sleep in microgravity, they can sleep anywhere, by simply curling up in a corner to doze. Because some find the free-floating sensation of their arms strange, astronauts often secure their limbs with restraints or fold their arms across their chests while sleeping in microgravity. In previous space missions, noise and bright lights on board often necessitated the use of sleep masks, earplugs and even sleeping pills. 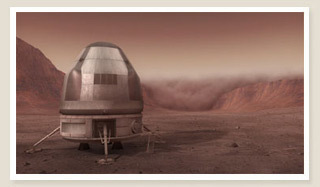 Private quarters would almost certainly be required onboard for an extended Mars mission. In Gulliver’s Travels, first published in 1727, Jonathan Swift describes the two moons of Mars, 150 years before they were officially discovered and named by astronomer Asaph Hall. Although many scientists dismiss this as a coincidence, the imagining of Mars by writers, thinkers and movie directors has created a sci-fi folklore that’s both informed and fueled popular interest in the Red Planet. Of course, much of this “informing” process has involved pure speculation. The suspense and mystery of exploring the unknown makes for good fiction. As does, apparently, mistakes in translation. When Giovanni Schiaperelli, an astronomer from Milan (1835-1910) mapped Mars in the 1870s, noting structures he called “canali” (Italian for channels), English speakers thought he had discovered canal-like structures made by aliens. It didn’t matter that the canals were soon discovered to be an illusion—American astronomer Percival Lowell had already concluded they were real, artificially-made structures, describing Mars as a marginally habitable. Lowell’s work triggered a sci-fi trend in books, movies and stories about Mars, and the funny green aliens that supposedly inhabited it. In 1898 writer H.G. Wells penned a nightmarish depiction of a Martian invasion of Earth. War of the Worlds popularized both the belief in aliens, and dystopian sci-fi, a horror genre that plays on our fear of the unknown universe. 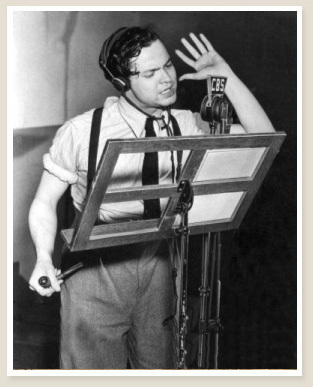 When War of the Worlds was broadcast as a radio play with Orson Welles in 1938, many listeners thought it was real and panicked. While we consider ourselves more media savvy today, Wells’ story is still compelling—over the past 100 years, it’s been reproduced numerous times in multiple media, from music, movies and comics to computer games. While Mars sci-fi surged in the 1930s-60s, with movies, popular stories and books by such writers as Leigh Brackett and Edgar Rice Burroughs, the imagined Mars, with its extended dream of alien life forms, was dashed in 1976 when two NASA Viking probes landed on the planet. The probes showed a dry, desolate place, and no existence of life. Many believed this was proof that Martians and alien life forms existed in imagination alone. As a result of more thorough scientific and geological surveys of Mars in the past two decades, scientists have discovered that the Mars of our popular imagination, the one that is warm, wet and hospitable to life, may have actually existed millions of years ago. 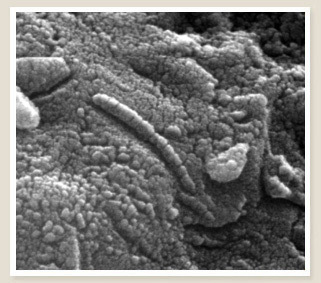 And in 1996, NASA research conducted on a Martian meteorite showed some evidence for the existence of microscopic life. While science fiction endures, the popularization of the Internet in the 1990s and 2000s has sparked widespread interest in the real-time exploration of Mars. 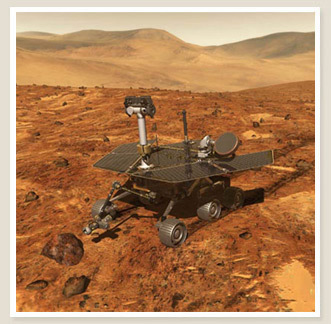 NASA’s Pathfinder rover mission (1997), for example, remains one of the most popular events in Internet history, watched on the web by millions. Because landing on Mars and exploring it is exceptionally difficult, however, the mysteriousness of the Red Planet continues. Hutchison River Parkway still kept open for motor traffic. Avoid bridges to Long Island… hopelessly jammed. All communication with Jersey shore closed ten minutes ago. No more defenses. Our army is… wiped out… artillery, air force, everything wiped out.